SPADs were a lot like Messerschmitts, Mustangs and Spitfires. It was the aeronautical definition and representative for its country of origin during its service time. It would go on to become one of the aircraft that defined the air war. It was not accepted outright by airmen who had become accustomed to effortlessly throwing their aircraft around the sky. When it first entered combat the Hispano-Suiza engines that were installed were only 150 hp. This gave it performance similar to German aircraft at the time. It was not long before the SPAD drivers found that the new fighter was a very good fighter. If they refused to fight the Germans on the Germans terms and only fight them on their own terms. 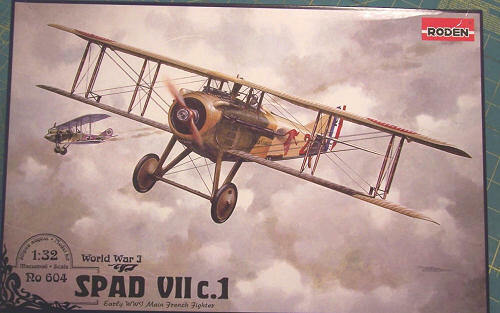 The big advantages of a SPAD driver was the ability to out run, out climb and out dive the enemy. With these advantages you had the ability to engage or break off combat at will and thus the French pilots could fight the battle that they wanted. The first thing that I noticed when I opened the box was that this kit seemed to have more parts than any of Roden's earlier 1/32 scale kits. The plastic is the same gray/beige as earlier offerings. The suture marks are still present on the larger parts but don’t seem to leave any visible marks on the surface of the parts. One thing that Roden got right here is that they put the ejector pins in places that will be hard to see once the model is assembled. I would say the kit is about 99% flash free. The plastic is also very heavy, soft and flexible. If you have worked with any low pressure, limited run kits then I think you’ll be familiar with this type of plastic. A problem with this kind of soft plastic is that it is prone to sink holes, but at first look I see only two slight ones at the propeller hub. They will be fixed with some putty. All the control surfaces are separate, so you can pose the surfaces easily. The majority of all the little bits seem to be mostly marked for the engine and cockpit area. 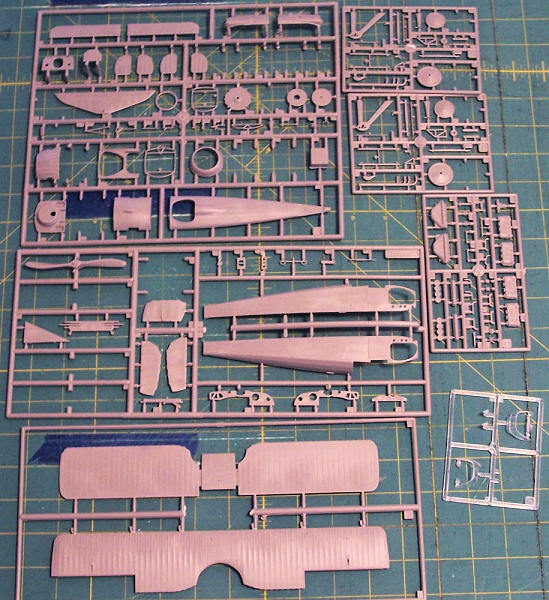 Sadly I don’t think that you will be able to see most of these parts once the model is built. But it is nice to know that they are in there, even if you are the only one that knows. All the surface areas have the classic pebbly finish that is very reminiscent of the DML SPAD 13 kits of the 1990s. I think that a coat of paint will cover that up. 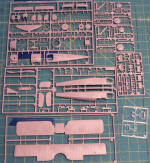 The sprues were molded with a lot of parts to build the early and final production versions. All the parts that are not needed in this kit have been past Betty Bendemoff so you will not get any unneeded parts to rattle around your spares box. I’ve been told that plastic is like gold in Ukraine so they are likely putting the parts back in the melt to use on other kits. Oh, I forgot to tell you, the kit includes only parts for a late enlarged cowling version. The only problem here is that the radiator is exposed and it has ABSALUTLY NO DETAIL on it. I’m not kidding here, it is just a Hexagonal slab with a central bump for the propeller shaft. I guess that you can fix this with a piece of fine screen. The instructions are classic Roden. Clear, large and printed on eight pages. I can’t think of any more to say here, but that I wish more companies did as nice a job. Last but not least the decals. Like all Roden decals they look to be printed spot on. I look forward to trying them out. I want to see if they are any better then earlier experiences. In the past I’ve found that the white in Roden decals is not opaque and that they don’t respond to Solvaset at all. The colors look a bit off to me. The French national colors are represented as an orange red and very bright blue. Who knows, maybe after I apply them to the model they’ll look better. I think that any of the problems that might be encountered will be easily conquered with a little patience especially since Roden kits are known for there fiddly nature. If I were to pick one thing about this kit that I would like to change it would be the French national colors on the decals. The more I look at them the more they jump out at me as being wrong. I compared them to other decals of the French cockade and they really look more orange then red and the blue looks strikingly bright. Oh well I guess I can’t have everything. “French Aircraft of the First World War” by Dr. James Davilla and Arthur M. Soltan, Flying Machines Press (This is arguably the best publication on French aircraft used or designed during the First World War and well worth the price). Review kit was courtesy of Earls Hobby Hanger in Logan, Utah.